fruit at The Audubon Cottages each morning! When I left off on Part 1 of this article, we had enjoyed a wonderful dessert at Restaurant Stella! and drifted off to sleep with very full bellies. We woke up on Saturday morning to the sound of...pouring buckets of rain! But did we let this dampen our fun? Nope...our friend Roderick left us Audubon Cottage logo umbrellas to use, and we were good to go. We found a lovely continental breakfast spread on the table and had a small bite to get us going. Our first stop was a New Orleans institution...and one of the best bargains you’ll find in the city: Cafe du Monde for beignets and chicory coffee. An order of three puffy beignets will only set you back $2-and-change. It was warm and humid that morning, but we didn’t mind...we quickly found a seat and ordered. If you’ve never had beignets, they’re a French version of a doughnut...minus the hole...coated with a thick layer of powdered sugar. Heaven! Cafe du Monde is open 24-7 and only closes on Christmas. That’s a LOT of beignets, friends! 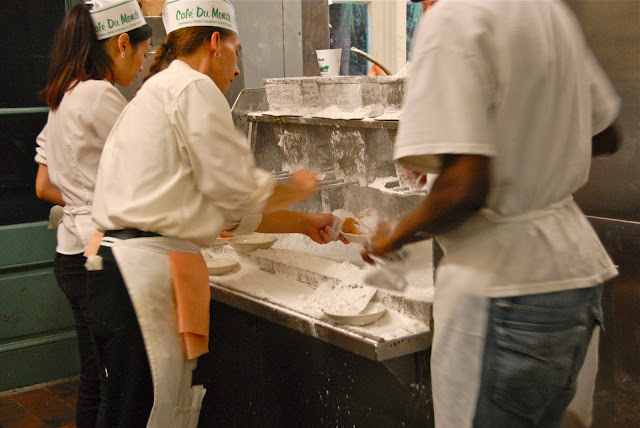 Fresh, hot beignets getting a generous dusting of powdered sugar at Cafe du Monde. 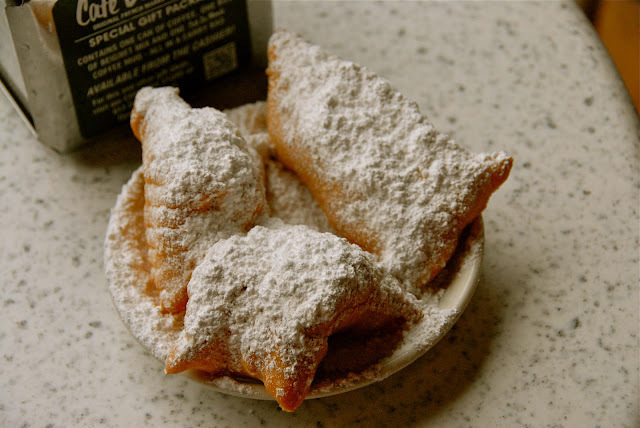 Perfection: hot, crispy beignets coated with a generous helping of powdered sugar...what a way to start the day! the French Quarter since 1979. From there, we headed to have what we thought would be a quick bite of gumbo at K-Paul’s Louisiana Kitchen. Instead, we were greeted by Brenda Prudhomme and escorted to a large table in the back of the restaurant, just outside the kitchen. 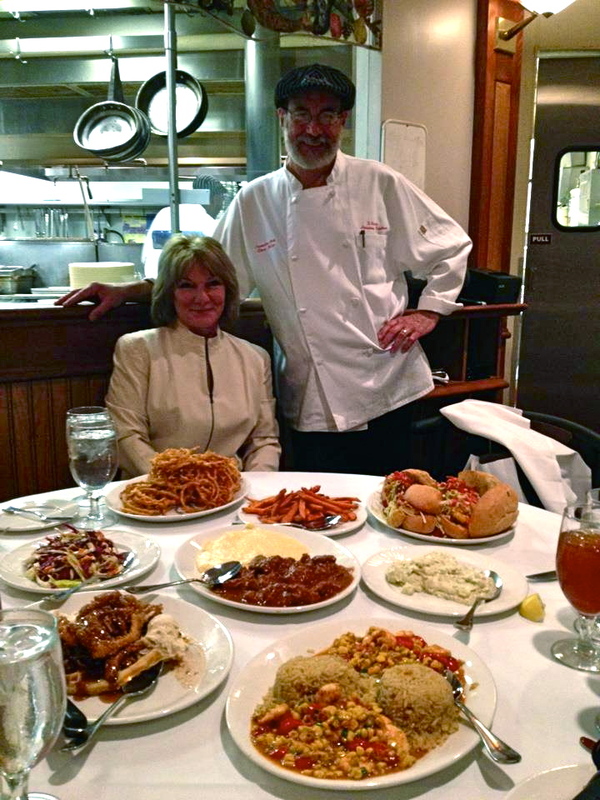 Brenda is the restaurant’s Accounting Manager, as well as the niece of owner/chef Paul Prudhomme. She’s also married to K-Paul's Executive Chef Paul Miller. They both greeted us warmly and proceeded to serve us most of the items from the day's lunch menu. For the next two hours, we ate some amazing food, including chicken and andouille sausage gumbo, shrimp po boys, shrimp and corn macque choux, and chicken and waffles. We also enjoyed lively conversation with Ms. Brenda and Chef Miller. For now, I’ll leave you with this picture of them...and the spread. To hear all the details of this amazing meal, come back next week when I feature K-Paul's in this month’s special edition of The Weekend Gourmet Dines Out. K-Paul's Executive Chef Paul Miller. The atmosphere at The Irish House is warm and inviting. Before we knew it, it was time to head up St. Charles Avenue into the Garden District to visit Chef Matt Murphy at The Irish House. This authentic Irish pub and restaurant is fairly new on the NOLA dining scene, but it’s quickly making a name for itself. Once we visited, it wasn’t hard to see why. Chef Matt is a fabulous host...and a really wonderful chef. 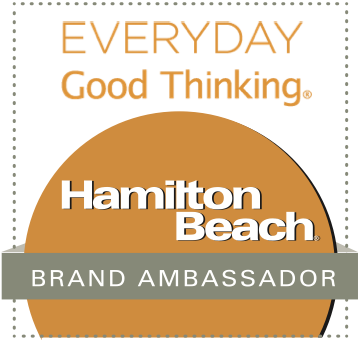 He recently appeared on Food Network’s Chopped...which he won! His food is what I would best term upscale pub food...familiar enough to be comfortable, with some gourmet twists. 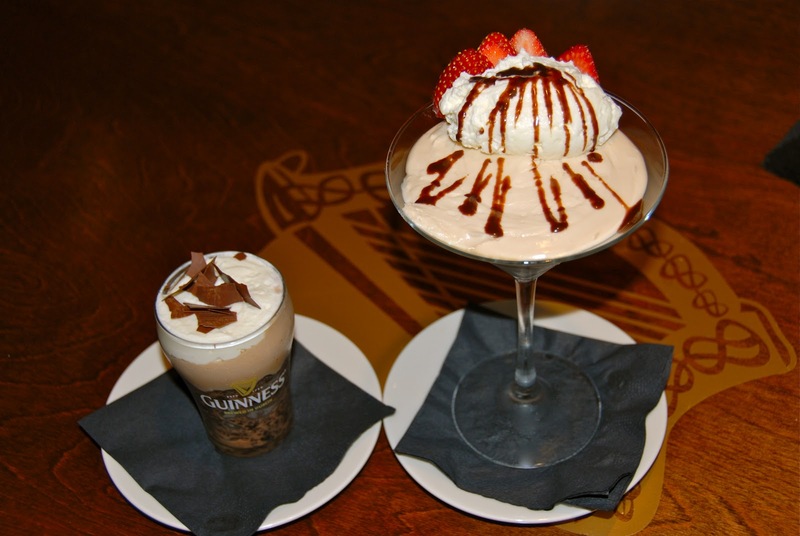 Over the course of three hours, we sampled lots of items from the menu...along with pints of Guinness. Not a bad way to spend a rainy weekend afternoon! We enjoyed all the dishes, but the beer-batter fish and chips was a true standout: crispy and not at all greasy...and the tartar sauce was perfection! 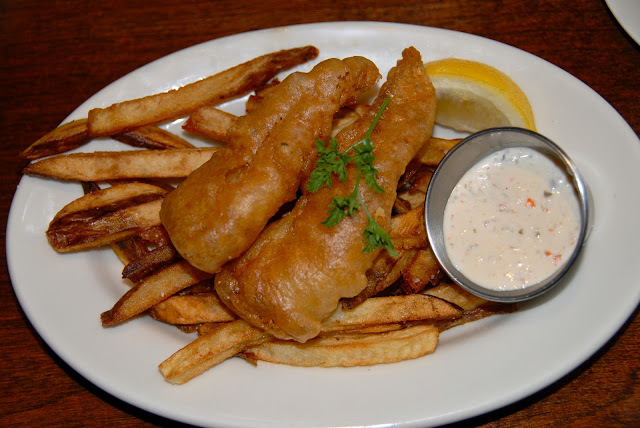 Perfect fish and chips: light-as-air beer batter, tender fish, and amazing tarter sauce! Some of the other dishes we tried included an authentic Irish Breakfast Sampler, Fig and Brie Stuffed Duck Breast with Celeriac Puree and Sour Cherry Brandy Sauce, and Cider Braised Pork Cheeks Honey Clove Jus. The pork cheeks were a standout: fork tender, and the honey clove sauce was rich and fragrant. 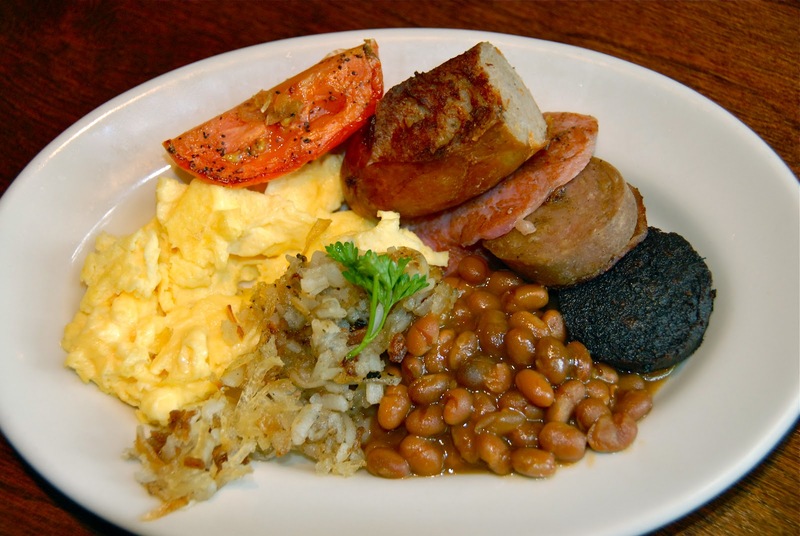 A traditional Irish breakfast: eggs, hash browns, baked beans, grilled tomato, three kinds of sausage, and bacon. Duck breast stuffed with savory brie and sweet figs, served over celeriac puree with yellow squash and zucchini. 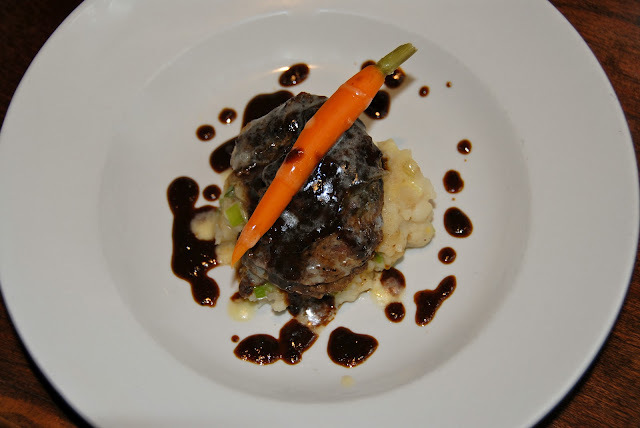 This was our first time to try pork cheeks, but they were amazing...succulent and fork-tender! 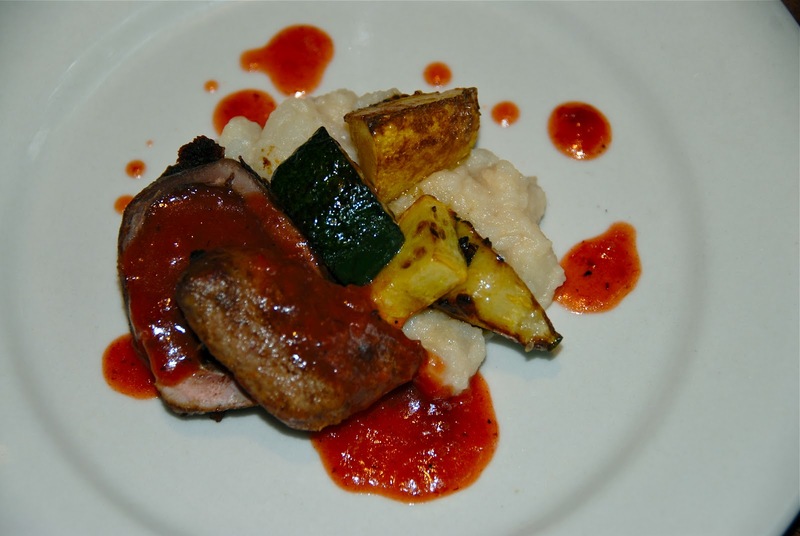 The sweet and savory honey-clove sauce paired perfectly with the savory pork. 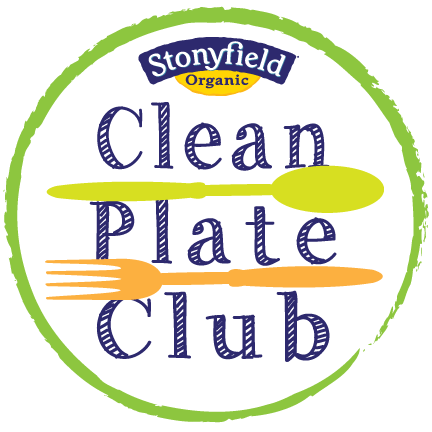 We took our time enjoying each course, visiting with Chef Matt and his friendly staff in between...while we digested and made room for more. We were getting pretty stuffed when out came dessert: Guinness Chocolate Trifle...served in a miniature Guinness glass...and creamy Bailey's Cheesecake. Anybody who knows me can attest that I always have thismuch room left for something sweet at the end of a meal! Both desserts were rich and decadent. They were the perfect ending to a wonderful afternoon of sampling Chef Matt's delicious food. Before we left, the entire Weekend Gourmet gang took a picture with Chef Matt. As you can see, he's a great host...with a great smile! 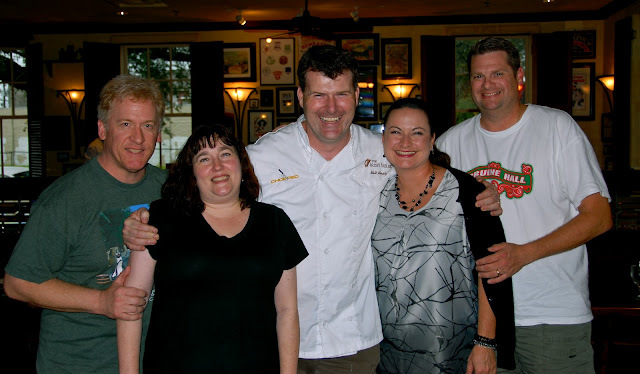 The Weekend Gourmet gang with Chef Matt Murphy after a fabulous afternoon at The Irish House. We waddled out of The Irish House and quickly realized there was no way we’d be hungry in time for our 800 dinner reservation at Jacques-Imo's. I called to move our visit to an hour later...and we promptly took naps back in the sanctuary of The Audubon Cottages. After a nap and a shower, we were ready for dinner. Jacques-Imo's is a restaurant we've wanted to eat at for ages, but we never had luck getting a table on our past trips. That's how popular this restaurant is with its loyal fans! 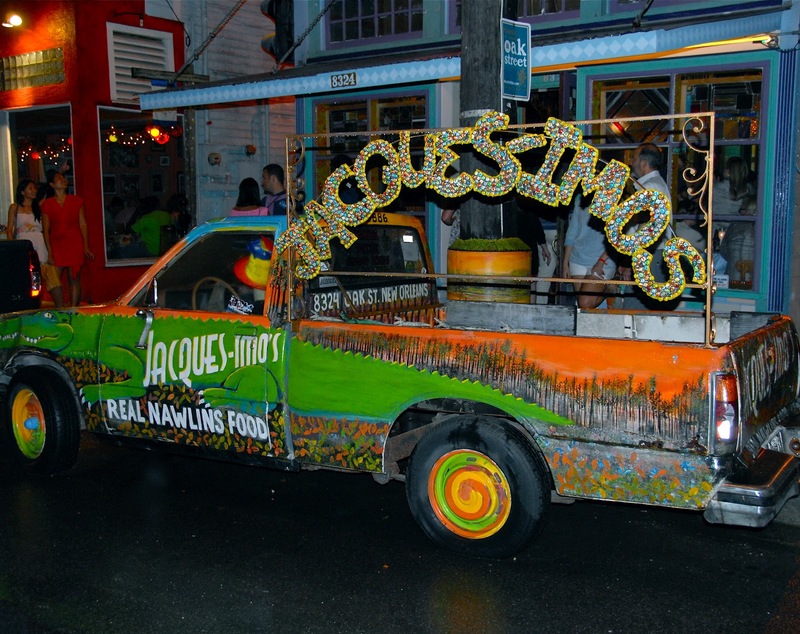 Jacques-Imo's is a one-of-a-kind experience: funky ambiance and some amazing Cajun food. The restaurant is located Uptown, which is accessible via the St. Charles streetcar or a 15-minute drive from the French Quarter. We were seated and served some of their signature items family style. That was perfect, because it allowed the four of us to sample everything without getting too full. shrimp remoulade, and shrimp and alligator sausage cheesecake. First to arrive were two appetizers: the signature Shrimp and Alligator Sausage Cheesecake and Fried Green Tomatoes with Shrimp Remoulade. Everybody we told we were eating here said not to be put off by the alligator, because the cheesecake was amazing. Oh man...were they ever right! It was creamy, spicy, and so very good. The spicy shrimp remoulade paired perfectly with tart fried green tomatoes. 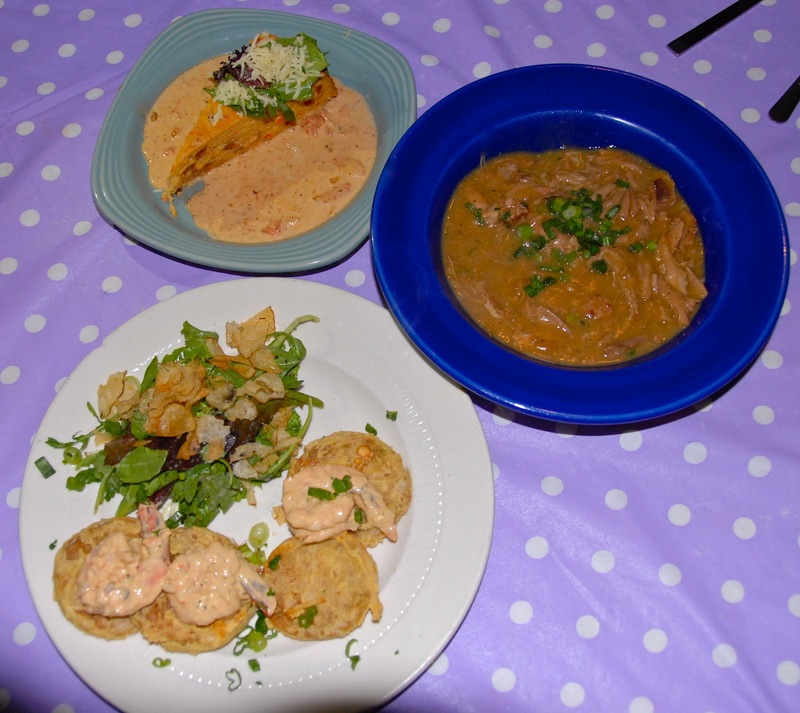 By the time the chicken and sausage gumbo made it to the table, we were grinning ear to ear! 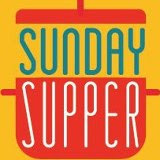 Then came a parade of entrees and sides, including blackened redfish, their popular fried chicken, and soft-shell crab. 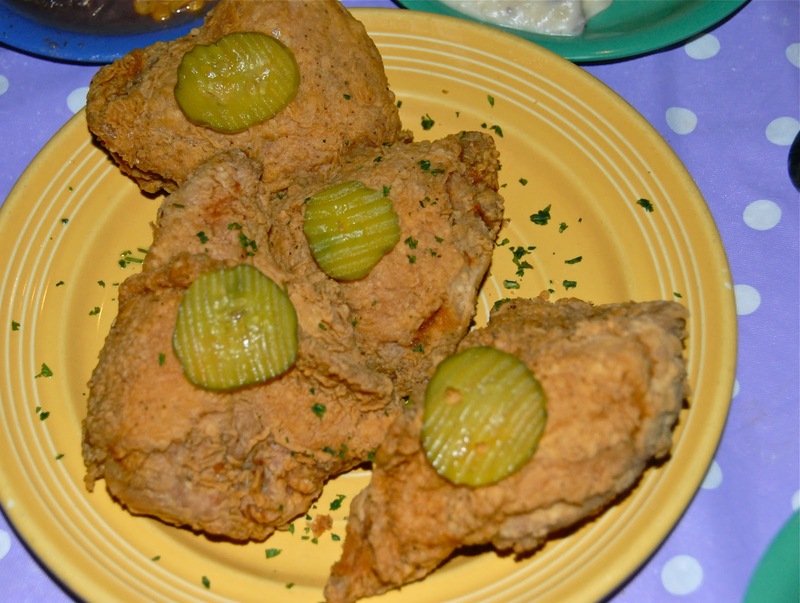 All of them were fabulous, but the fried chicken is some of the best I've ever tasted: crispy on the outside, juicy on the inside, and not the least bit greasy. Our sides included mashed sweet potatoes, corn macque choux, and smothered cabbage. on the inside. Perfectly seasoned and not the least bit greasy! 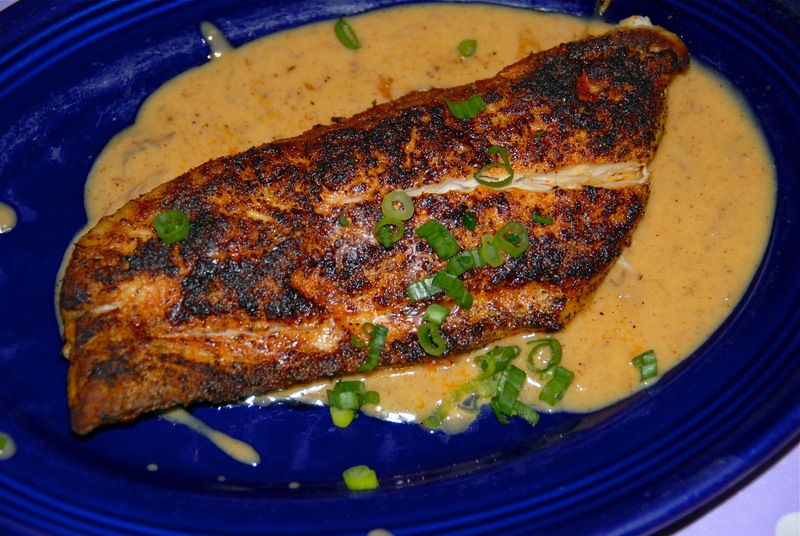 Blackened redfish served with a spicy cream sauce. Seared and spicy on the outside...moist on the inside. you're in for a good time! Jacques-Imo's truly lived up to its hype...the food is delicious down-home goodness, and the atmosphere is just plain fun! 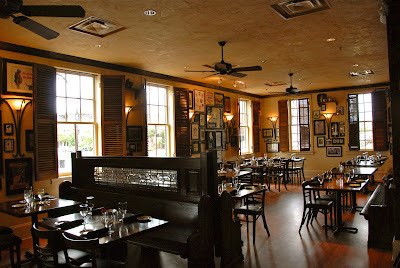 From the funky exterior to the crowded and eclectic interior, this is a dining experience unlike any other in New Orleans...or anyplace else for that matter. 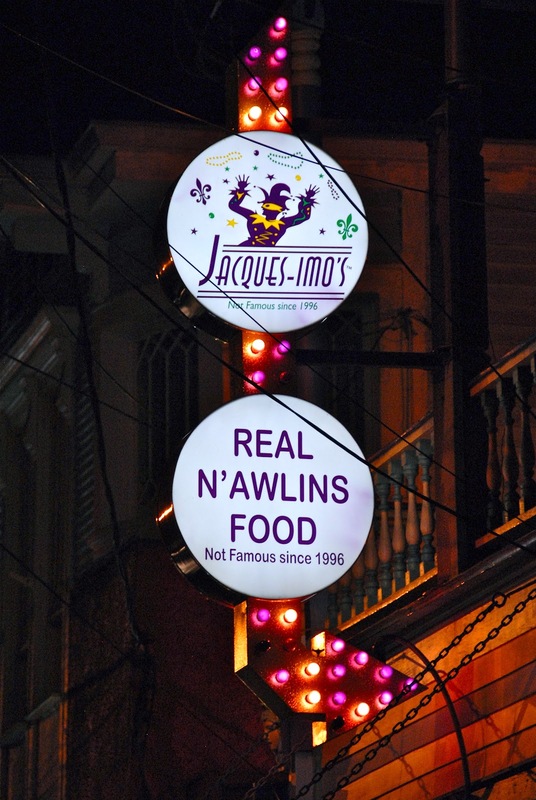 It has to be experienced to be appreciated, but know this if you go: Jacques-Imo's is very popular with locals and visitors alike, and they only take reservations for parties of five or more. That means you may have to wait a good while for a table...but trust me: this place is worth it. Have a drink at the downstairs bar or just hang out and people watch outside to pass the time. By the time our meal was over, it had been a full day of eating...literally from sun up to way past sun down! We made our way back to our cottage, changed into our pj’s, and were asleep almost immediately. We needed plenty of time to digest...because we still had one more foodie adventure on the agenda before we left New Orleans: Sunday Jazz Brunch at the legendary Commander’s Palace. To hear all about that -- and learn about some of the best sweet treats NOLA has to offer -- come back here on Monday. Disclosure: The New Orleans Convention and Visitors Bureau hosted our trip to New Orleans, arranging all of the complimentary meals eaten to facilitate this article. All photographs were taken by my husband, Michael K. Garcia. 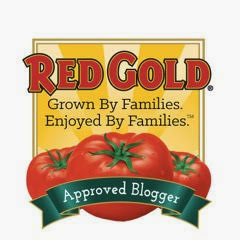 They are copyrighted and may not be reproduced or copied without express written permission. I think I just licked my computer screen:) I think New Orleans has some of the best food in the world. My mouth is watering just thinking of those wonderful beignets. 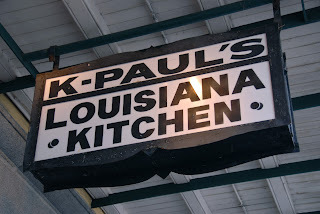 I've been to K-Paul's kitchen and it is fabulous! Received my Essential Cane sugars. Thank you!